Whether you’re a novice runner or a seasoned veteran, injuries can occur at any time. Although there is no guaranteed way to prevent all aches and pains, there are certain steps you can take to provide your body with its best defense against pre-finish line injury disaster. It’s essential to train our muscles in multiple ways in order to avoid injury and any potential overuse problems. Utilise bikes, cross trainers, stair climbers and swimming pools to add other low-impact cardiovascular exercises to your routine. These types of exercises provide you with a good workout while limiting the strain on your legs, knees and joints. Additionally, incorporate upper and lower extremity strength training, as well as core stability, into your training regimen to build overall strength. This well-rounded approach to working out will help you avoid injury. Stretching is critical to injury prevention. Runners should stretch before and after runs to avoid strains and tight muscles. Calf, hamstring and iliotibial tract (IT) band injuries are notorious for causing problems. Stretching before and after a run can help you avoid these types of injuries. And if you are sore or experiencing pain, be sure to rest and ice that part of the body. If the issue persists, it’s advisable to seek professional advice from one of our specialist chiropractic team or other suitably qualified healthcare professional . It’s important to address all problems, even if you think or they feel minor. An injury can easily be exacerbated if you push your body too far. Taking this approach often gets you back training faster and stronger as opposed allowing an injury to become chronic and more difficult to treat. Everyone’s feet are different and have specific requirements. Spend time at a reputable shoe store to ensure you get the correct shoe. If you buy a new pair of shoes, be sure to break them in and get used to them before race day. You want to be familiar with the performance and feel of your shoes well before you start a race. Just because you have a trusty pair of shoes from years ago doesn’t mean they are the right pair for a run. Old, worn-out shoes increase your risk of injury and negatively affect running efficiency as does a poor running gait pattern. Poor foot m echanics can cause foot pain and unnecessary stresses further up the body, resulting in knee, hip pain and back pain. 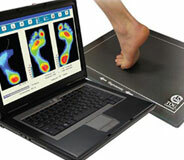 A computerised gait scan is a highly accurate method of evaluating an individuals gait pattern and this can facilitate the prescription of custom made insole orthotics to correct an individuals gait imbalance whilst running and walking where necessary. Running is a fun, effective way to stay active, but without proper injury prevention strategy and proper conditioning, you could end up hurting yourself. By following these tips, you can be in a better position to avoid injury and maximize your race day results. This entry was posted in General Information and tagged back of knee pain, back pain treatment Gorey, chiropractic wexford, chiropractor, chiropractor wexford, foot pain, gorey family chiropractic clinic, Knee pain treatment Arklow, knee pain treatment Gorey, orthotics, orthotics gorey, plantar fasciitis, runners knee, shin splints, sports injury treatment gorey by admin. Bookmark the permalink.